Seagate has demonstrated heat-assisted magnetic recording technology with 1 trillion bits per square inch, a 30 per cent improvement in Toshiba's production record of 744Gbit/in2 with its MQ01ABD drive – a 2.5-inch, 5400rpm, SATA II drive. Seagate's highest production areal density is thought to be the 3TB Barracuda, a 3-platter drive with a 620Gbit/in2 areal density. The company says: "The bits within a square inch of disk space, at the new milestone, far outnumber stars in the Milky Way, which astronomers put between 200 billion and 400 billion." All current drives use perpendicular magnetic recording technology (PMR), which was introduced in 2006. As HDD manufacturers try to squeeze more data onto the disk platters' recording surfaces, the bit size in successive generations of this technology shrinks. It is predicted the bits will become increasingly unstable and not hold data properly at the 1Tbit/in2 level and beyond with PMR technology. In the quest to have smaller bit sizes with stable magnetic charge two main technologies are being investigated. Bit-patterned media (BPM) puts an insulating ring around each bit to stop neighbouring bits influencing its magnetic charge. Heat-assisted magnetic recording (HAMR) uses magnetic material that is more resistant to having its magnetic polarity changed unless it is heated. A heating laser is added to the disk's read-write head to accomplish the short burst of heating needed to write data to a HAMR bit. The chart below shows the currently known hard disk drive (HDD) supplier maximum areal densities, together with Seagate's trillion bit areal density. 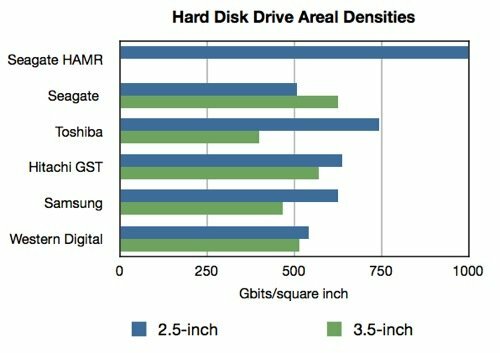 Generally 2.5-inch disk drives have higher areal densities than 3.5-inch drives and, other things being equal, the faster the drive spins the lower the areal density it uses. Seagate's demonstration is a marker that indicates its position that HAMR is preferable to BPM. El Reg assumes that's it's not the best that the technology can achieve either. If it were used in Seagate's Savvio 10K.5, for example, then its capacity could roughly double, from 900GB to 1.8TB. Seagate suggests initial HAMR technology could provide 6TB for 3.5-inch drives and 2TB for 2.5-inch models: "The technology offers a scale of capacity growth never before possible, with a theoretical areal density limit ranging from 5 to 10Tbit/in2 – 30TB to 60TB for 3.5-inch drives and 10TB to 20TB for 2.5-inch drives." El Reg thinks we will see one more PMR generation, at or around 800Gbit/in2, and then HAMR may be the technology to take us to 1Tbit/in2 and beyond, first appearing possibly in 2016. Seagate speculates that we could see 60TB 3.5-inch drives around 10 years after HAMR technology enters production. Bear in mind that disk I/O speeds are static and that it will take 20 times longer to read an entire 60TB drive than a 3B drive. Fortunately on-disk flash caches will enable chunks of data to be read more quickly than that.